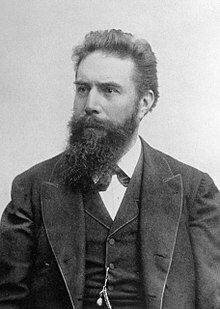 Wilhelm Conrad Röntgen (27 Mairch 1845 – 10 Februar 1923) wis a German pheesicist, who, on 8 November 1895, producit an detectit electromagnetic radiation in a wavelenth range the day that wis kent as X-rays or Röntgen rays, a achievement that earned him the first Nobel Prize in Pheesics in 1901. In honour o his accomplishments, in 2004 the Internaitional Union o Pur and Applee'd Chemistry (IUPAC) namit element 111, roentgenium, a radioactive element wi multiple unstable isotopes, efter him. ↑ Novelline, Robert. Squire's Fundamentals of Radiology. Harvard University Press. 5th edition. 1997. ISBN 0-674-83339-2 p. 1. This page wis last eeditit on 13 Februar 2018, at 23:50.